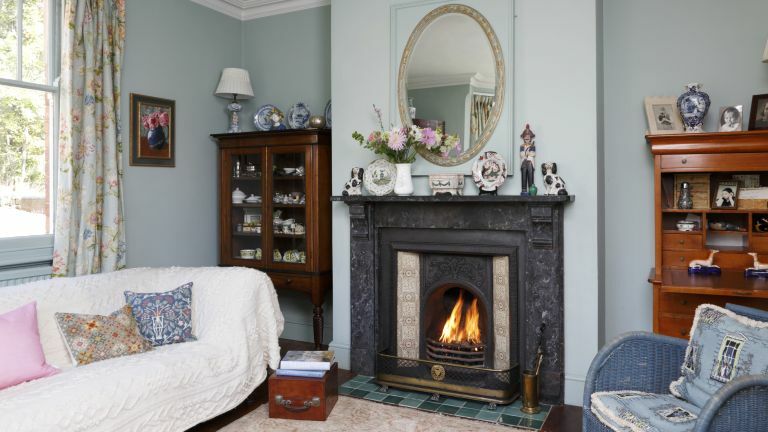 Cosy and comforting, an original fireplace alight with burning coals or logs is the ultimate period feature. But keeping the fireplace burning involves more than just filling the grate with coal or logs. Fireplaces and chimneys require regular attention to work safely and efficiently and, even if they are never used, some routine maintenance will be inevitable. The simplest task is to have the chimney swept by an experienced chimney sweep at least once a year and more often if fires are lit very regularly. Address problems with a smoking chimney promptly, along with any doubts about its structural stability — it will work out cheaper in the long run. Clean fireplaces from time to time to keep them looking good, and repair individual elements as and when they give out. Fireplace shops and some salvage yards are a good source of spare parts, care and repair products and, in most cases, abundant advice. Have chimneys swept regularly by an experienced sweep. Ensure the chimney is safe and in good working order when first used. Check carbon monoxide and smoke alarms frequently. Fit both if they are not already installed. Take into consideration that chimneys are affected by erosion from the inside due to the corrosive effect of flue gases. Always burn dry, well-seasoned wood, otherwise tar deposits might collect within the flue. Inspect chimneys externally as they take the full force of the weather. Look for loose chimney pots, eroded mortar on the stack and defective flashing where chimney and roof meet. In the roof space check for dampness around the chimney stack. When buying a salvaged fireplace take precise measurements to ensure that all the parts fit. Regularly clean the fireplace, clearing ash and debris from the grates. Fill any cracks and gaps that appear in the fireback and surround. A fire in a fireplace or stove should burn well with smoke and fumes carried away via the flue. Chimneys must be swept at least once a year by a professional chimney sweep and more often if fires are lit regularly. Good chimney sweeps will advise on potential problems. Twigs in the hearth from a bird’s nest. Plaster, brick, stone or soot debris coming down the chimney. Damp patches or staining appearing on chimney breasts. There are several reasons why smoke may gush back into the room instead of rising up the flue. A lack of air is the most common cause. Open fires need at least six changes of air in the room per hour to burn well. To check if poor air starvation is the problem, try opening a door or window – if the smoke clears then the solution is to boost air supply, for example by installing vents or underfloor ducts. Smoky fires can also be caused by chimneys getting blocked by debris or nests, hence the importance of regular sweeping. Smoke can sometimes be blown back down by downdraughts where a chimney is too short or overshadowed by surrounding high buildings, trees or hills. Short stacks can be built up or extended by fitting special cowls or pot extenders. Where a fire struggles to burn, it may be choking on exhaust gases that are not fully dispersed. This may be due to a poor airflow or because of a downdraught. Problems with indoor air supply are common in houses where draughts have been totally sealed up so there’s just not enough air being sucked into the fireplace. The solutions are as described above for smoky fires. Air leaks through defective brick joints can allow toxic smoke and fumes to seep into rooms. Leaks can be traced using smoke pellets. Test for leaks using a smoke pellet bought from a fireplace shop or plumbers’ merchant. If possible, temporarily seal the top of the flue, although scaffolding will generally be required for access. Light the pellet in the hearth and then examine the entire length of the chimney, including the loft space, for smoke leaking out through the masonry.The solution is to have the flue professionally lined. Over time, excessive soot and tar can build up on ledges inside a flue, eventually igniting. Flues need to be swept at least once a year to remove combustible soot deposits and blockages, especially if burning green unseasoned wood or peat, which are particularly aggressive fuels. Sweeps should be NACS or HETAS approved. Unprotected chimney pots can allow bird access and nesting. The solution is to fit a special protective bird guard. Cast iron is the most common material used to make period fireplaces and can usually be brought back to life where it has deteriorated. Use a wire brush to remove rust and loose material on the surround. Where necessary use a chemical rust remover. Following the manufacturer's instructions, finish the metal with black stove grate polish and burnish with a brush or soft cloth. A heat-resistant paint is another option. Look after wood surrounds like other joinery. Buff wood regularly with a lint-free cloth. If cleaning, using a well-diluted detergent solution and a cloth without soaking the timber. The surfaces of stone and marble are easily damaged by household cleaners if they contain any acid, so make sure you invest in specialist supplies. If in any doubt, where the piece is valuable, consult a specialist conservator before undertaking repairs or cleaning. Some 'marble' fireplaces are in fact scagliola, a mixture of plaster and aggregates that imitates marble and which is easily damaged. Always test cleaning products on a small, inconspicuous area first and, if the surround is particularly old or valuable, take expert advice, especially when dealing with excessive soot deposits, red wine or rust stains. If layers of paint are obscuring decorative details on cast iron and wooden fireplaces, apply proprietary strippers or poulticing systems that peel away. Stripping is always best done in situ with surrounding areas well protected by dust sheets. Removing a fireplace for professional stripping can result in damage and disturbance to the chimney opening so is best avoided if possible. Check firebacks for cracks. Where these are minor they can be patched with fireproof cement but more major problems may mean that you have to find a replacement. Plug gaps between the fireback and fire surround with fireproof rope or string as this allows for expansion and contraction between the surfaces. Tiles are a feature of many fireplaces and would originally have been inserted from behind. This makes repair or replacement tricky so you may decide it’s better to live with a damaged tile — seek advice if in doubt. Where draughts are entering a room through an unused fireplace opening, consider inserting a chimney balloon to temporarily block the chimney. Want more? Follow our step by step guide to cleaning a fireplace. Maintenance of a stove is vitally important to ensure that the components are working safely and that no combustion gasses are escaping into the room. Ensure that the door fits snugly, the hinges are not misaligned or worn and the latch operates effectively. Examine the fireproof seal of the door to check that it is not flattened or misshapen. Test the stove by lighting a small fire, close the door and move a candle around its edges. If the flame is drawn towards the fire this means the seal has failed and must be replaced. When the stove is cold, brush out all ash and vacuum. Using a torch, inspect the firebricks for damage and ensure air inlets are clear. Clean the window with a stove glass cleaner. A soot or tar covered window can indicate that the stove it not burning efficiently. Replace cracked glass immediately. Find out more in our step by step guide to cleaning a stove. The fumes from a fire pass up the flue, which is contained within the chimney. These flue gases are potentially deadly and it is important to remember that any form of combustion may result in carbon monoxide, an insidious gas that has no smell. In addition, poorly maintained chimneys can lead to house fires, especially in thatched properties and where roof joists or other timbers have been built into the structure of the chimney — something that is not unusual in old buildings. Debris falling down a chimney, including mortar and bricks, may be a sign of problems so always ask a sweep whether there is any evidence of this when they are working. With any chimney, but especially one that has not been used for some time, it is worth testing it for leaks using a smoke pellet. This is lit in the hearth and is always more effective where it is possible to block off the top of the chimney to contain the smoke within the flue. Check for smoke leaking through the walls of the chimney in the rooms above and in the roof space. Where problems are suspected specialists can survey chimneys internally with a camera and it may be necessary to have the chimney lined. Find out more about repairing chimneys in our guide. It’s essential that old flues are correctly lined, to prevent dangerous leaks developing. Flexible single-skinned stainless-steel liners are widely used for gas fires, and for oil and gas-fired boilers. Hardier double-skinned versions are required for solid fuels and for woodburning and multi-fuel stoves. Stove flues need to be properly insulated as they generate extreme heat, a common cause of thatch fires. Liners are usually installed by being pulled down the old flue by an attached rope, with the space around the liner then back-filled with loose insulation to prevent condensation. To make repairs, employ experienced bricklayers or roofers who understand old buildings and use appropriate lime mortars and techniques; scaffolding will probably be needed. Even if a chimney leans it may still be perfectly stable but if you are in any doubt, it is advisable to consult a structural engineer or surveyor. In some cases it is possible to add a tie rod and strap connected to the roof to enhance stability. Chimneys from inglenook fireplaces are often topped by flagstones raised on bricks to provide a rain cap. Various terminals or inserts are available for chimney pots to improve performance or stop rain entering the flue. Bird guards can also be fitted to prevent them from nesting inside. If the roof is thatched, spark arrestors are generally installed to stop cinders escaping. It is essential to ensure that these are properly maintained and cleaned otherwise they may increase the risk of fire. For more advice, the Dorset Fire and Rescue Service publishes an online guide about fire prevention in thatched dwellings.